Happy Tuesday! It's time to squeeze in some Christmas in July cards. 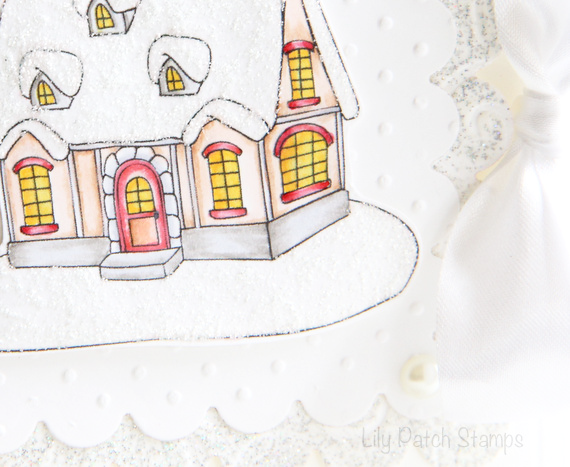 Tuesday Throwdown has a fun challenge this week with a No Patterned Paper theme. This challenge pulled me out of my comfort zone and got me to use tools that I rarely think of using. The sponsor for this week's challenge is Robyn's Fetish. I am using this beautiful image called Christmas Cottage. 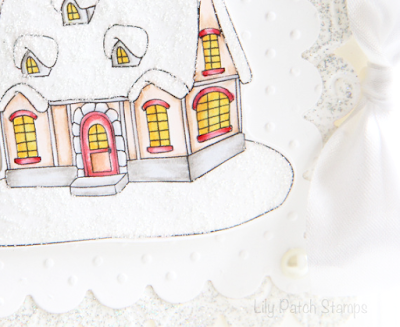 I fussy cut the cottage image after coloring and used 3-D foam tape to place it on the embossed die cut paper. I also did some wet embossing and used diamond dust. That's one of those things I haven't used in a long time. It sure was fun. I also used a stylus to create the embossed lines to frame the image and then added a bow. Please head over to the TT blog for more DT inspirations and enter to win some fun products from Robyn's Fetish. This is Gorgeous. Thank you for entering the World Wide Open Design Team Monthly Challenge. Beautiful card. Thank you so much for entering our challenge at World Wide Open Design Team Challenge Blog Looking forward to see you again soon. Beautiful. Thank you for entering the World Wide Open Design Team Challenge. Thanks for joining us at World Wide Open DT challenge. You have a very beautiful card. Thanks for joining us at World Wide Open DT challenge. Beautiful card! Thank you for joining us at World Wide Open Design Team Challenge. Good luck with your entry. Amazing design! The WoW effect is so perfect to surround that gorgeous cottage and I adore that lush bow! Kim this is a wonderful creation with great attention to detail and perfect for our FIRST challenge. Thanks for sharing your talent with us. Good luck. Amazing!! Thank you so much for entering our ATG challenge at Through The Craft Room Door this week. Looking forward to see you again next challenge. Gorgeous....love that little cottage! Thanks for joining us over at Crafty Calendar this month & good luck! Hello friend! :) I love how you've used this image!! Gorgeous card and I love the texture and sparkle on this!! So stunning!! Hope all is well with you my friend!! SENDING HUGS!! Stunning card!!! Come and join us in our Quirky White Challenge. Such a sweet little Christmas card. Love embossed layer and white on white. Thank you for sharing your beautiful card with us at Sparkle N Sprinkle. This is so sweet. Love all the white on white with touches of color. Thanks for sharing it with us for the Sparkle N Sprinkle Creative Challenge.